An interview with John Allen, Assistant Director at Camp North Star, a Maine Camp Experience Camp. 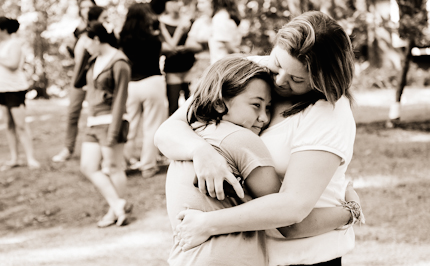 What does the concept of “co-parenting” mean for summer camp? Co-parenting is the approach we take at Camp North Star to make sure that parents, as well as kids, are taken care of throughout the camp experience. We understand that there’s a huge commitment made both by the camp and by the parent, and that it’s an important decision to send a child away for the summer. So we try to make sure goals are being met and that while the child is at camp, communication is taking place so that camp and the parents can make a collaborative effort in making sure the child is well taken care of. What kind of communication fits into the co-parenting approach? As soon as a child is enrolled in camp, we make sure we start to get to know the child and his/her parents. So that once he or she arrives at camp we have a good understanding of the family’s background, what’s going on at home and at school, if there are any problems in either of those areas. We try to make sure an effective communication plan is in place from the outset. Before a child comes to camp, we have several of our current families reach out to the new, incoming families to get to know them better and make the transition into camp smoother. Oftentimes, kids are anxious that everyone already knows one another, but if we can form a connection ahead of time then the process is easier. As soon as a child first arrives at camp, the directors observe to see how they’re adjusting, collaborating with their peers, engaging in the activities. There are a lot of different components, but we update the parents as soon as possible and continue the dialogue throughout the summer. What are some benefits to taking a co-parenting approach? The most immediate benefit is the relaxed atmosphere we have at camp. A lot of parents are nervous about sending their child away, especially in that first year. But because parents know their child already has a connection going into camp, they feel more at ease. The long-term benefit with this communication is that we get to know our parents and campers intimately over the course of the year, not just over the summer. We often find ourselves invited to bar/bat mitzvahs and birthday parties and family events. Even just going to a family’s house for dinner and eating with them has a huge impact on that family. It lets them see that we’re genuine in the way we approach our communication. You mentioned meeting goals during camp, how does this work with your co-parenting approach? We start by communicating with parents regarding summer goals for their child. Some are straightforward. Like they want their camper to improve his/her tennis ability, to swim better, or kick a ball farther. Those are simple. But often hidden within those, there are additional goals. They want to be a better tennis player because of the social impact that this will have for them during the school year. Maybe they really enjoy tennis, but they’re the weakest on the team and find themselves struggling and being made fun of. So they want to improve that social aspect through a simple goal. We try to delve deeper into what the goals are and what they mean. There is a learning curve whenever we meet a child, but we find that the first summer experience has a lasting impact moving forward. Is there a story you can share that shows how this style and approach has benefited a specific camper? Absolutely. I can probably tell you a hundred stories. But I’ll just share the one I’m most connected to. A camper who came to camp six years ago and who is still with us today came in with a lot of struggles. A few years later we learned that he was diagnosed with Asperger’s, which wasn’t a huge surprise to us because we worked so closely. But he was very difficult to work with. He tended to shy away from the group, go off on his own, etc. I worked with him over a few summers and made sure our communication was constant. The development was slow at first, but I remember one instance when we were sitting and talking — which happened often — and he turned to me and said, “John, why is it so difficult for me?” It was good to see him opening up like that and it was really good to see him be able to communicate what he was feeling. This is six years ago at this point, so it’s been a long journey for him. This camper has experienced a profound outcome and this success has been realized because of the coaching and effort of our camp staff in partnership with his family. Not only is he an accepted and celebrated member of the camp community but he has forged real friendships that are active both at camp and throughout the year. Today I see him every once in a while — outside of camp and of course in camp as well. We still communicate back and forth pretty frequently. He is much more social, and he’s developed a talent for music. He still has struggles, but the impact camp has had over the last few years has been a huge part of his life, and my life, too. That’s really wonderful. How do parents respond to this additional effort? The response we get is similar to the response we get from kids. They don’t really know what happened over the course of the summer. They have a general idea of the activities their child is participating in, and we’ve been communicating how their child has been feeling. But oftentimes we find that once the camper goes home, the parents say to us, “We don’t really know what you did, but you did something and it’s amazing.” Children go home with more confidence and the ability to tackle problems in a new way. Communication with peers and adults often improves ten-fold. That’s the kind of feedback we get from parents. It’s hard for them to verbalize exactly what they’re seeing, but they see what we see: which is the best version of their child.